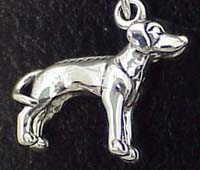 This sterling silver Rhodesian Ridgeback charm is a special piece of handcrafted jewelry. Each Rhodesian Ridgeback charm would be a gleaming addition to any Rhodesian Ridgeback jewelry collection. It makes a nice Rhodesian Ridgeback gift item. Approximate size on the Rhodesian Ridgeback charm is 5/8 inches.